Just Had to do it! I have been MIA for a couple of months due to some serious surgery, and am finally getting some of my energy back....yippee!! Thanks to all of my wonderful friends who sent me cards, FQ's, emails, texts & well wishes. It really did help me to know you cared. So....that said... and today being National Quilting Day I just had to come on here and wish everyone a Happy sewing/quilting day. I'm sewing some batik fabrics into vertical rows and making a Chinese Coin Quilt....easy and fun! I don't know how long my energy will last or if I'll get it finished today.......but I'm sewing! Yippee! What are you doing today in honor of National Quilting Day? I've wanted a tablet for about a year now, and thought I'd wait to see the new Surface by Microsoft 'cause it looks so light and the "click on" keyboard really appealed to me. So, I started doing research on tablets a couple months ago and passed on the Surface RT, went to the Surface Pro, but found out it was way TOO COSTLY for my budget. So, I continued with my research, including the Ipad, and chose the Samsung Galaxy Note 10.1 with 32GB and got it last Friday! I'm in love with my new toys and notice the word toys is plural.....lol You can't just have one piece of Lego...can you? Got the leather case bluetooth keyboard too. Also got a Portable 1TB external hard drive for my pc, another SD card, but didn't take pictures of those and haven't played with either of them....yet! Here's the case/keyboard folded up......not bad! I hope I can stop playing with my new toys long enough to do some sewing/quilting. Maybe I'll have to limit myself to playing during my break times and not take my tablet into the sewing room. The New Year and January always brings with it many goals and so many things I want to do. What about you? Messes! especially messes in my sewing room! Arrrrrgh! There was really no way I could start or finish up any of my sewing/quilting projects until I tackled this mess. but I'm talking snips, threads, unuseable scraps). There was no way all the scraps for my 2 1/2" squares bin were going to fit in this bin. I'm not finished yet.......but it's a start and now I can see my cutting table again. What do you do with all of your scraps? Thanks for visiting. Stay tuned by subscribing ......just sign up on the RH sidebar of this page. Christmas with my Red Hat Sisters! Whew! I got that over! NO, I'm not going to talk about my plans for 2013, nor about New Year's Resolutions. I promised my Red Hat sisters that I would blog and share about our Christmas party.....so have to keep my promise to them. Our Chapter of The Red Hat Society is called Rubies and Garnets and is one of the first chapters formed in San Antonio, Texas. I've been a member for many years. We meet on a monthly basis and go to different restaurants in and around the San Antonio, Texas area. We are a noisy bunch...laughing, and talking so much that when it's time for our Queen to make some announcements or for a prize drawing...there's a china bell one of her helpers rings to quiet us down.....(ahem!)...politely. We have been going to the Fair Oaks Ranch Country Club for our Christmas celebration for several years now and boy oh boy...do they ever deck this place out for Christmas! Everywhere you go there's Christmas trees, poinsettias, garlands, displays. This is one of the many entryways and it leads to our banquet room. One of the many displays! One of the many Christmas trees ...each one decorated differently. The tables in our banquet room. The Chandelier in our "party" room. All decked out in our Red & Purple...waiting for everyone to arrive! The table and Red Hat sisters where I sat. Time for other things; like sewing, quilting, & giveaways.....stay tuned! Be sure to subscribe to my blog (RH sidebar) 'cause I promise some fun things and wonderful surprises this year........AND..... I always keep my promises. Are You Sure It's December? Do ya'll remember the commercial with the old lady saying......"Where's the Beef"? Well, I'm saying............where's Winter in Southern Texas? Are you sure it's December? Here's what I saw in front of my house yesterday. We've had such warm days in San Antonio that some of the trees are late in changing colors and dropping their leaves. Are you sure it's Winter? I was looking for some Poinsettias...........but found these instead. I really do miss the cooler days.......crisp temperatures........and snowy days this time of year. I'd love to build a snowman! But, don't be too concerned. I get over it quickly when I start to see pictures of buried cars in the snow, kids dressed like the Michelin tire guy, and snow shovels, everyone wearing stocking hats and heavy scarves around their necks..... on tv and the internet. I'll be smiling then, as I go outside in my shorts & t-shirt. 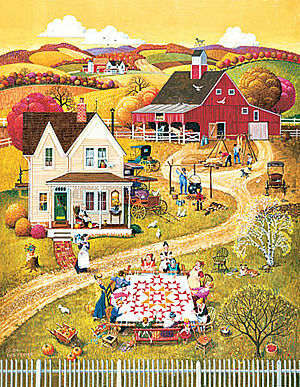 What picture comes to your mind when you think of quilters? Do you see the big oak tree with several ladies sitting under its shade, a pitcher of lemonade on a table close by...all working on a patchwork quilt...sewing each stitch by hand...sharing all the "newsy gossip"??? This "picture" of quilters from years gone by is similar to our current quilt bees and quilt guilds of today. Now, we have "cyber quilt bees" on the internet. We share everything we do; our quilts (naturally), but ........also our ideas, questions, sewing tips, our patterns, our fabrics, and our lives, news of our families, pets, areas where we live, our joys, our sorrows......etc. 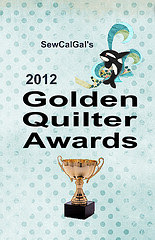 I belong to a wonderful "cyber quilt bee" through my Etsy Shop and the team on Etsy....called Quiltsy. (See the Quiltsy badge on my RH sidebar) Besides sharing all the things above, we help each other with our Etsy Shops to increase our sales. Everyday most of us visit our chat discussion on the team for our "social quilt bee" online. We even have our own Quiltsy Team Blog. so we can share our projects, patterns, and items for sale in our Quiltsy Team Shop. 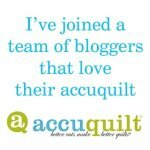 I invite you to become a follower of the Quiltsy Team Blog. One of our Quiltsy Team members Karen Jones (aka Tessie Textile) created an "electronic" quilting newspaper called World Of Quilts Daily. It's sew fun to get this electronic newspaper totally devoted to quilting. Today's issue includes a few of my most recent quilted items, so naturally I want to share it..... (remember....I'm a quilter...and we share!) LOL I hope you enjoy reading all about it! You can subscribe to it too...upper RH corner. What kind of quilt group do you belong to? I linked up this post to Quiltsy's W.I.P. Wednesday post. No, it's not really snowing in San Antonio..........but I can dream, can't I? Living here is wonderful in the wintertime, but my heart always longs for the glistening sparkling crystals on fresh snow. So it is that I'm always looking for Christmas prints that have snowmen on them, or snowflakes, with glitter resembling the glistening sparkles. Here's the post where I first showed you this fabric. I also found the perfect white tonal with circles on it that look like snowballs.........where?....... in my stash.....amazing! When I make a "find" in my stash of something that is just what I need, I get so excited. Sure does justify having a HUGE STASH, doesn't it? Here's a couple pictures of what I made. Table Runner ﻿21" x 41"
Here's the back of it.....simple wavy lines, along with stitch in the ditch... for the quilting. 6 Mug Rugs/Candle Mats 9"x9"
And the backs........with the blue plain matching the scarves color on the snowmen! Another stash find......ta da! The Table Runner and mats are available for sale in my Etsy Shop. 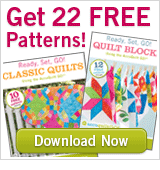 AccuQuilt Free Patterns - Click Here.